Making sure the BPU™ is installed correctly - Amps. Making sure the BPU™ is installed correctly - kWh. The BPU™ improves the poor power quality caused by harmonics, unbalanced phases, surges, and poor power factor and stores this wasted energy in the iterative transformer controller. The iterative transformer is able to capture and store and then recharge the capacitors that become the least resistive circuit. Thus, the loads will draw from the BPU™ first and then from the utility meter thereby reducing the kilowatts consumed. The patented electromagnetic theory practiced in the BPU™ iterative transformer provides for the storage and recharging of the capacitors. Every other power conditioning filter on the market throws electrical noise away. That noise is power that you have already paid for but cannot use. Electrical noise is caused by computers, televisions, cell phone chargers, LED bulbs, switching power supplies and variable speed drives. What makes our technology unique, is the ability of our electromagnetic reactor to filter out all of the electrical noise , correct the distortion and supply it back to the building as useful power so there is no waste. See attached specification sheet. One or more BPU™s can be installed on a single panel board, and/or sub-panel(s) and/or equipment. The key is to analyze the facility and that is why we use a Dranetz power meter to gather the important metrics. The data you have provided to us for review contains the relevant metrics. Then a site survey needs to be taken to better understand the operation of the facility such as type of equipment, lighting, duty cycles, tie-breaker or not, etc. See attached spec sheet. Based on this information, we can determine the appropriate number and sizes of BPU™s needed to do the job and where they need to be installed. That is why we like to look at data and talk with the facility electrician and/or engineer to better understand what consumes the power in the facility, or the specific type of issues the facility or equipment may have. Our objective is to solve the customers’ problems whether it is high-energy costs, voltage surges and sags, or something else. 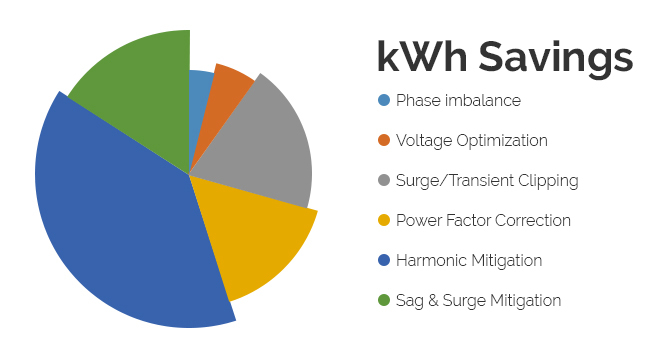 What proportion of the 8-20% kWh savings can be attributed to the various power quality solutions within the BPU™ technology? No. Our units do represent an electrical load but as the BPU™s magnetic core acts like a generator that load is not registered at the utility meter or on a power quality analyzer. We love showing this surprising effect during our installation. Yes, a fully vetted and patented technology with additional domestic and international patents pending. The BPU complies with 508A and CSA C22.2 No. 12. The BPU is available in NEMA 4, 12 and 13 enclosures for indoor and outdoor installation. How long does it takes to install BPU™ to my location? What’s the installation process? The BPU™ can be installed in approximately 2 hours by certified electrician. Please note that BPU™ requires optimal ground and breaker in your electric panel. Will the power supply be turned during the time of installation? * Local codes and permits may apply. Please consult a licensed electrician. Does the BPU™ come with a warranty? Yes, full 10 Year Warranty and expected 25 Year Lifespan. Are there any financing options available? How long does it take to pay for itself? Typical ROI is 12-24 months, this number varies based on your energy consumption. We already have high efficiency electrical devices installed such as A class energy saving products, LED lighting, etc. Will the BPU™ work for me? Yes the BPU™ is compatible with all other energy conservation and power quality measures, energy efficient equipment and technologies that have variable speed drives. The BPU™ can improve the performance of renewable energy systems by optimizing the digital AC waveform from the DC inverter and will correct harmonic distortion from LED lights and switching power supplies. What else should I know about the BPU™? If the primary side of transformer is receiving 420 volts can the BPU™ system reduce it to 415 Volts on the secondary side or any other desired value? Can The BPU™ system increase the voltage in the secondary side of transformer? Can the BPU™ system be used in large in large consuming power in the range of 10MW and above? Can BPU™ system be used in high voltage applications? What voltage rating can BPU™ system be designed for? Limited to 480 volt circuits at this point although research has been done at higher voltages up to 1,400V. 1,400V. What is the smallest size of the BPU™ system that is and beneficial for saving point of view? See attached specification sheet. Basic Power is able to deliver 120V single phase; 208V 3-P; 380V 3-P; and 480 3-P. To handle the various kWh range of uses, multiple 2 units may need to be installed in parallel in the breaker panel if necessary. Also, a BPU™ could be installed on the main panel and other smaller units installed on sub- panels or specific equipment. In other words, multiple BPU™s can be installed and, through the auto-sensing feature, they will work in conjunction to improve power quality reducing kWh. Each unit must have a separate circuit breaker to hook into. Can the BPU™ system specifically designed for particular Motor or compressor as a inverter does, and actively reduce Current? Yes, in some cases kWh reduction is not the customer’s problem. We installed two C-208 models in a garage door manufacturing company in August 2014 due to voltage sags knocking out sensitive control equipment causing production delays and repair costs. We are installing a I-480 model this month at a Medical Center on a problem boiler. Current imbalance slandered. How much imbalance is allowed if our client is having 7% imbalance? How much will the BPU™ system further reduce it? Voltage imbalance slandered. How much imbalance is allowed if our client is having 3% imbalance? How much will the BPU™ system further reduce it? The BPU™ has impacted imbalances up to 20%. Voltage Harmonics VTHD slandered. How much voltage harmonics are allowed if our client is having 3% VTHD how much will the BPU™ system further reduce it? The BPU™ typically reduces current harmonics to less than 3%. What will be the standard for voltage unbalance at main LT? The BPU™ typically reduces voltages imbalances to within 1%. Do you have any other questions, concerns?